Accusations of harassment and even of murder have led to escalating tensions in Ethiopia between the long-entrenched ruling party and the opposition, a month ahead of general elections. But the Medrek, a loose coalition of eight highly varied parties without a real leader, ceaselessly denounces the conditions in which the vote is being organised. Non-governmental organisations agree and Human Rights Watch has denounced “the narrowness of the political space”. 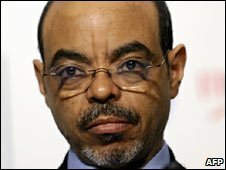 Meles, satisfied with an economic policy he says has led to a growth rate of 10,1% and 3,9% of inflation, on April 13 reminded Parliament of his determination to create conditions for “free, fair and transparent” elections. The National Electoral Bureau of Ethiopia, responsible for organising the poll, has devised with the government a code of conduct for international observers who will be sent by the European Union and the African Union. The death last week in controversial circumstances of a politician from the Oromo ethnic group — the largest of more than 80 in the Horn of Africa nation — has started a row, with each side claiming his political loyalty. According to Merara Gudina, vice-president of the opposition Forum for Democratic Dialogue (Medrek), when Binsa Daba died on April 16, he was attacked for his political stance by “four members of a [pro-government] local militia”. But Communications Minister Bereket Simon said that “Mr Binsa died of natural causes and was not even a member of the opposition,” but instead of the ruling Ethiopian People’s Revolutionary and Democratic Front (EPRDF) led by outgoing Prime Minister Meles Zenawi. Bereket said that the opposition was using all possible means to discredit the elections scheduled on May 23, which will be the first national polls since the 2005 elections led to violence in which at least 200 people died. The opposition has also claimed that the murder of a better-known political figure, Aregawi Guebreyohannes, in March in the northern Tigre region was a political killing, while the government says it came of a dispute. The government wants to ensure that May’s poll is not spoiled by fraud or the kind of violence that erupted in 2005, when opposition demonstrations were brutally put down by security forces. The opposition then wanted to denounce alleged fraud in the official outcome, after taking the best score of its history. Ethiopia has 80-million inhabitants, of whom more than 30-million are due to vote to elect their members of Parliament. International observers say that Meles (54) a former rebel leader in power since the EPRDF ousted the Marxist military regime of Mengistu Haile Mariam in 1991, has every chance of winning a new five-year mandate.